Hass is the main variety grown in New Zealand. It accounts for 95% of plantings and is the only variety currently able to be exported from New Zealand. Other varieties that you may see available include Reed, Maluma, Carmen and GEM. Hass, an A-type flowering Guatemalan hybrid, renowned for its good eating quality and post-harvest characteristics, is the most common commercial variety grown in the world and the main variety grown in New Zealand. It is the only cultivar for which export standards exist in New Zealand. Hass fruit are of medium size (200 to 300g), ovate in shape and have a thick, pebbled skin. The skin colour changes from green at harvest to black when ripe. Hass is one of the few commercial varieties that change colour as they ripen. Hass trees grow to a large, rounded shape and have the potential to produce heavy crops. 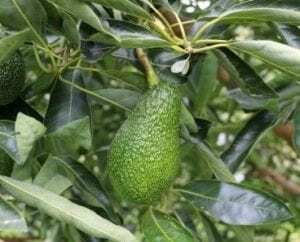 Typically fruit reaches harvest maturity levels in the Far North before the Bay of Plenty, this generally occurs 9 to 12 months after flowering or fruit-set. Reed is an A-type flowering green skin variety. Trees are upright and angular. The fruit are round, medium size (200-400g) and have a thick skin. The fruit mature in March-June (Bay of Plenty) and are good eating. Flowering is often later than in Hass and fruit-set can be very heavy, which may cause biennial bearing. New Zealand research has indicated that Reed may have a short harvest window for quality fruit and storage quality is lower than Hass fruit harvested and stored in similar conditions. Reed is freely available, and not subject to royalty payments. 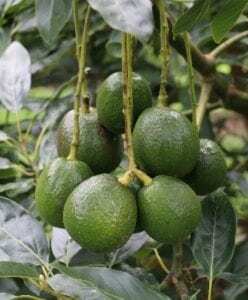 Reed avocados are available from some New Zealand nurseries at the time of writing. Carmen is an A-type flowering Hass-like cultivar managed by Brokaw Nursery, California. Spring-set Carmen fruit appears almost identical to Hass fruit and blackens on ripening. Carmen trees are reported to flower and fruit prolifically overseas, and from initial assessments it appears as though this is also the case in New Zealand. Carmen trees often flower out of season with floral blooms seen in autumn and winter (as well as, or instead of, in spring) and produce large, round, smooth-skinned, fruit. Autumn and winter set Carmen fruit appear almost identical to the autumn-set fruit occasionally produced by Hass trees. Carmen is available from accredited New Zealand nurseries, and is subject to non-propagation agreements and one-off royalty payments. Maluma is an A-type flowering cultivar from South Africa owned by Allesbeste. Its reported low vigour and tendency to grow with a central leader allows pruning to a pyramidal or Christmas tree shape and potentially makes it more suitable for high-density plantings. Its fruit blackens on ripening, is slightly larger than Hass fruit, and has more of a ‘neck’. The leaves of Maluma trees are narrower than those of Hass and the margins are turned upwards, appearing ‘curled’. International reports indicate that Maluma is highly productive with consistent bearing patterns. Anecdotal reports indicate that Maluma may defoliate after heavy flowering, however this should not be cause for alarm as fresh flush usually follows quickly to replace the vegetation. Maluma is available from accredited New Zealand nurseries, and is subject to non-propagation agreements and one-off royalty payments. GEM is an A-type flowering cultivar from California managed in New Zealand by Seeka Kiwifruit Industries Limited (Seeka). Overseas it has been reported to be highly suited to high-density planting as it grows as a more compact tree compared with Hass. It is reported to be high yielding, less alternate bearing than Hass, precocious and bears its fruit inside the canopy. It is also reported to have slightly greater frost tolerance than Hass trees. The fruit is teardrop shaped with a smooth skin and prominent yellow lenticels. The fruit turn black when ripe and international reports suggest they mature about one month later than Hass. This is yet to be confirmed in New Zealand conditions. GEM is currently being exclusively commercialised and evaluated by Seeka. 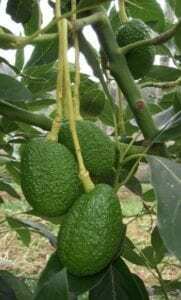 It is available from licenced avocado nurseries and is subject to a grower licence, which includes a non-propagation agreement and royalty payments. For further information contact Seeka (information supplied by Jonathan Dixon, Chief Technical Manager, Seeka). The approximate harvest period for available scions is highlighted above. Hass is usually harvested between August and March but season can extend to April and orchards can harvest as early as July. Reed, a later variety is picked for local market late summer through to winter. Maluma is harvest winter through early spring for local market. Carmen spring set runs identical to Hass however autumn/winter set fruit is harvested during April to July. 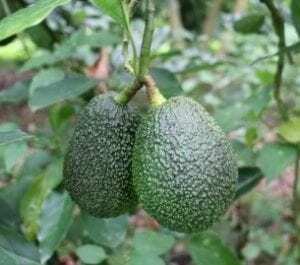 The majority of avocado trees currently planted in New Zealand are grafted onto seedling rootstocks. The variety Zutano is the most common source of seed for rootstocks. Seedling rootstocks are inherently variable. For example, some may be more vigorous than others or exhibit more/less tolerance to Phytophthora cinnamomi. Seedling rootstocks have the potential to produce satisfactory yields. Clonal rootstocks (vegetatively propagated) can overcome some of the variability in yield, vigour and tolerance to disease. They are commonly used in several countries to produce uniform trees with desirable characteristics (e.g. P. cinnamomi tolerance, high yield, tolerance to saline conditions, etc). Many of the imported clonal rootstocks are covered by Plant Variety Rights (PVR, similar to a patent) and purchase of these requires a non-propagation agreement. Bounty is a rootstock managed by The Fruit Farm Group, South Africa. It was selected for its P. cinnamomi tolerance and ability to survive in wet soils. Bounty is available from some New Zealand nurseries, and is subject to non-propagation agreements and royalty payments. Dusa is a clonal rootstock, which has increased significantly in popularity since the mid-2000s. 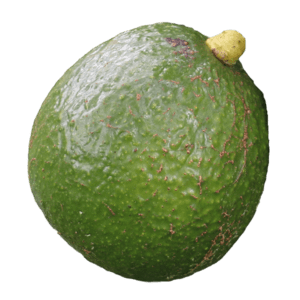 It is now commercially available in most of the major avocado-producing countries. It is a common standard against which other P. cinnamomi tolerant rootstocks are compared in international breeding programmes. Overseas, Dusa has been reported to bear fruit even under heavy P. cinnamomi disease pressure and have higher yields than many other rootstocks. Dusa is available as a rootstock from accredited New Zealand nurseries, and is subject to non-propagation agreements and royalty payments. Latas was first selected as a promising rootstock variety due to its ability to grow in waterlogged conditions in South Africa, and is managed by Westfalia. Overseas, it has shown promising results under moderate to heavy P. cinnamomi disease pressure. Latas is available from accredited New Zealand nurseries, and is subject to non-propagation agreements and royalty payments. Duke 7 was the commercial standard clonal rootstock in South Africa before Dusa. It was selected for its tolerance to P. cinnamomi and its ability to produce consistently higher yields than seedling counterparts. Duke 7 may be sensitive to waterlogging. Duke 7 is not protected under the PVR and as such is freely available without a non-propagation agreement and is not subject to royalty payments. Zutano is a B-type flowering, Mexican hybrid that produces thin-skinned, shiny green fruit that mature in July-August (Bay of Plenty). The B-type flowering make it useful as a polliniser for Hass. The thin skin makes the fruit prone to splitting and anthracnose infections. The trees grow tall and slender and can be planted close together. Zutano leaves are wide and light green in colour. New flush is usually red, and older leaves are often yellow. Zutano is the first variety of the new season and the fruit are generally considered poor quality because of their watery texture and flavour. Nurserymen often use the fruit as a source of seed for rootstocks. Being of Mexican parentage, the Zutano tree is slightly more cold tolerant than Hass. Bacon is a B-type flowering variety with Mexican parentage. The fruit is thin-skinned, smooth and green when ripe. Mature Bacon leaves are dark green and narrow while young leaves are red and narrow. Bacon trees are large, reasonably frost-tolerant and the variety is commonly used as a polliniser in New Zealand. Ettinger is a B-type flowering, green-skinned Mexican variety from Israel. Ettinger trees produce narrow leaves which have wrinkled edges. They do not often produce fruit in New Zealand conditions but are becoming increasingly popular as a polliniser. Edranol is B-type flowering variety which is used as a polliniser in New Zealand. The variety originated from California and trees produce dark green leaves and green-skinned fruit. Fuerte is a hybrid of the Mexican and Guatemalan races, are large trees with a spreading habit which exhibit B-type flowering. The fruit are pear-shaped, medium size (200-300g), finely pebbled, and have a thin to moderately thick skin. The skin remains green as the fruit ripens. The fruit mature in mid-August-October (Bay of Plenty). Fuerte trees often flower in August-September when conditions are cool and unsuitable for effective pollination; consequently, yields tend to be erratic and make this variety less suited for use as a polliniser. Fuerte should be planted only in the warmest sites. Fuerte was the commercial standard before Hass became widely available. Share the post "Varieties and rootstocks"